Ukraine’s Naftogaz has paid Russia’s Gazprom $30 million as a down payment for gas deliveries. The almost bankrupt firm is struggling to repay its $2.5 billion debt to Russia. “The money is on our transit account,” a source in Gazprom said Thursday confirming that Naftogaz had sent the $30 million to the Russian gas monopoly. On April 1 Gazprom and Naftogaz signed an agreement on gas supplies for the second quarter of 2015, known as the ‘summer package’ it replaced a similar ‘winter package’ signed at the end of October, 2014. In June 2014, Gazprom put Ukraine on gas prepayment plan after its ‘chronic’ failure by Kiev to pay the accumulated debt then exceeding $5 billion. Naftogaz debt to Gazprom now totals $2.471 billion including penalties, Russian Energy Minister Alexander Novak said in April. Ukraine now pays Russia $247.18 per one thousand cubic meters of gas which includes a $100 discount. The new agreement is also on prepayment terms. Naftogaz has been paying Gazprom in small installments. At the end of April the company paid $40 million, up from the $15 million it was paying at the beginning of the year. On Wednesday, Ukraine’s antitrust committee started an investigation into Gazprom over a possible violation of Ukrainian competition legislation, said head of the committee Nikolay Barash. This was made after Kiev complained Moscow had set unfairly high gas prices. Ukraine sees no need to pay larger sums for gas, Energy Minister Vladimir Demchishin said in March. However, Naftogaz Chairman Andrey Kobolev told Ukrainian television in February the company has been on the brink of default since 2009. 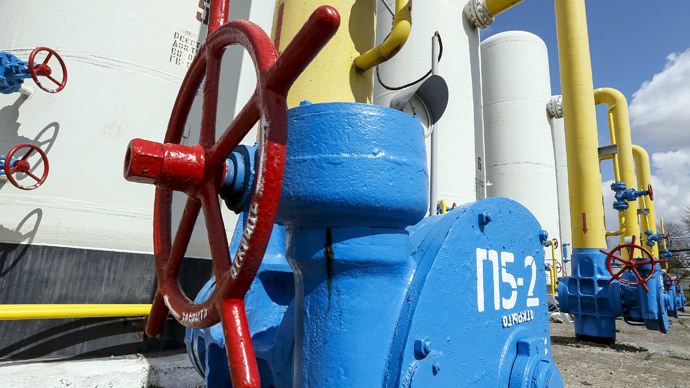 In April, Ukraine imported 294.5 million cubic meters of gas from Russia. On April 11 Naftogaz began to pump the gas into underground storage facilities which already contained 7.6 billion cubic meters of fuel. Within a month 1.4 billion cubic meters of gas worth $350 million were pumped into the facilities. To make sure heating systems don’t run out of gas in the coming winter the underground storage facilities must hold 19 billion cubic meters.